The folk rock band played the last date on their Babel tour at the weekend and told Rolling Stone that they are now ready for a long break so they can "rest up". Keyboard player Ben Lovett said there "won't be any Mumford And Sons activities for the foreseeable future" but admitted the group "have no idea" how much time they will take off. He went on: " We just know we're going to take a considerable amount of time off and just go back to hanging out and having no commitments or pressure or anything like that. It feels like the last week of school right now, before school holiday when you're in high school. The atmosphere on the road is one of... I think everyone's excited about being free of schedules." The I Will Wait singers have had a busy year in terms of their career, with their tour, a headlining slot at Glastonbury and wins at the Brits and Grammys. And in June bass player Ted Dwane underwent surgery t o remove a blood clot on his brain. "We're just going to rest up," Ben explained. "I don't think we've had actually much time in the process to be with other people and living a life outside of the band. 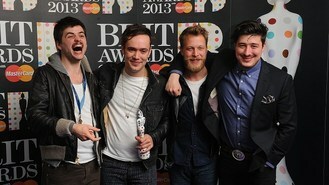 I think that's what's in place at the moment, to do very little - especially when it comes to Mumford And Sons." The band, fronted by Marcus Mumford, posted a message on their website at the end of their tour, thanking fans for their support. It said: "Well thank you everybody, once again, for an incredible tour. We cannot begin to tell you how much we love what we do and how lucky we feel that we've got to spend these past 6 years touring around the World, playing our songs to good people who have supported us the way that you do."